A mid-season variety with excellent productivity. The canes are tall and thornless growth is strong. The fruits are excellent caliber, an average of 2 gr. Nova by more than fruit. Fruits are light-coloured, firm and sweet. A mid-late season variety with excellent hardiness and excellent productivity. The canes are spineless, medium in height with good suckering. 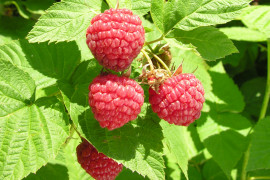 Raspberries are large, medium red with excellent firmness and good flavour. The variety is susceptible to orange rust with low vigour in sandy soils. 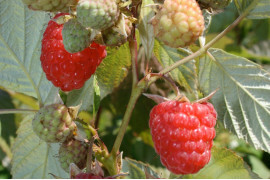 A mid-season variety with excellent hardiness and excellent productivity. The canes are spiny, tall with strong suckering. 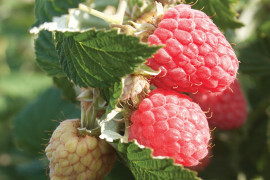 Raspberries are small, medium to light red, with good firmness and good flavour. Very popular variety for fresh market and freezing. A mid-late season variety with very good hardiness and very good productivity. The canes are very tall with little spines and good suckering. 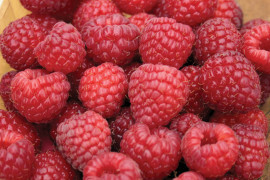 Raspberries are large, medium red with excellent firmness and good flavour. Resembles Festival but with more vigour and resistance to orange rust. Mid-season variety of excellent hardiness and productivity. Canes of medium vigor with spines and of medium suckering. 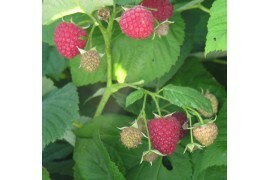 Berries are deep red with good firmness and good flavor. Fruit size slightly larger than Boyne.